like Chief Seattle, he’s seen the light. “And when the last Red Man shall have perished, and the memory of my tribe shall have become a myth among the White Men, these shores will swarm with the invisible dead of my tribe, and when your children’s children think themselves alone in the field, the store, the shop, upon the highway, or in the silence of the pathless woods, they will not be alone. In all the earth there is no place dedicated to solitude. At night when the streets of your cities and villages are silent and you think them deserted, they will throng with the returning hosts that once filled them and still love this beautiful land. The White Man will never be alone. 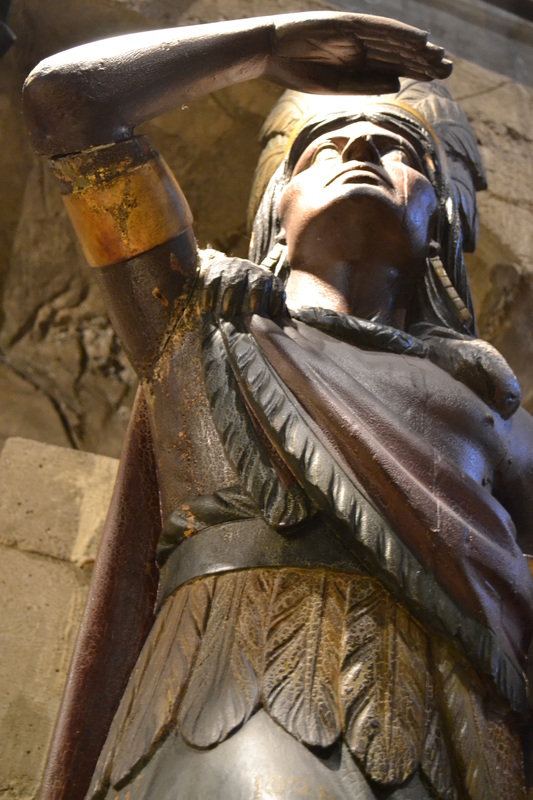 Tobacco Store Indian (Mercer Museum, Doylestown, PA). Image captured in with a Nikon D3100. © 2013 by Gina Marie Lazar Lovrencevic. All rights reserved.